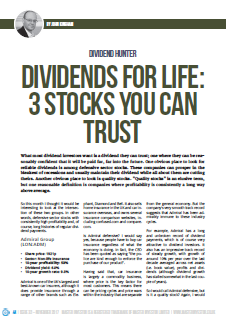 Trustworthy dividend stocks are hard to find. Yes, you could look at Unilever, Reckitt Benckiser, or any of the other “bond proxies” which dividend investors are so in love with. But those stocks are mostly expensive and personally I want to receive a nice dividend yield today as well as healthy dividend growth tomorrow. There are alternatives to these expensive defensives though, and in this month’s Master Investor magazine I looked at three of them. What do you think about Centrica and SSE? Are they worth holding on to? Hi hold both and as yet have no intention of selling. Neither is exactly setting the world alight though, and SSE has far more debt than I’d like. The main reasons I’m holding on is their depressed share prices, but if things turn (further) south then one or the other may have to go. However, that sounds pessimistic, and a gloomy fate isn’t written into stone for either company. Five years from now they could be doing well, in which case hopefully their share prices will have appreciated accordingly.